Registration Now Open! Click the "Register Now" link above to register online, or click here to download and print the registration form. If you would like to be added to NCAI's wait list for a group-rate sleeping room at the Marriott Kansas City Downtown, please send your name, contact information, and check-in/check-out dates to Holly Naylor at hnaylor@ncai.org. The Marriott Kansas City Downtown is still taking reservations during our conference dates at their standard rates. To reserve a standard rate room, call the Marriott Central Reservation line: 1-888-236-2427 or visit the hotel's website. Click here for information on transportation options in Kansas City! The NCAI Policy Research Center’s 13th Tribal Leader/Scholar Forum provides an opportunity for researchers, practitioners, community members, and others to present their findings to tribal leaders, policymakers, and tribal members during NCAI's Mid Year Conference. For more information on our Policy Research Center, click here. 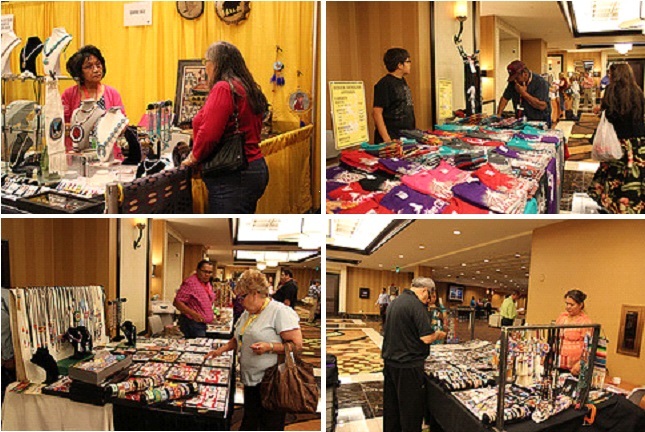 The Marketplace is a wonderful opportunity to shop with top Indian Arts & Crafts vendors, talk with representatives from Federal programs, and Tribal Enterprises, and receive career, education, and health information from the wide variety of vendors. Payments can be made by check/money order and sent to the above mailing address. To pay by credit card, go to our online store. Please Note: Exhibitors must send in both a signed contract and booth payment to complete their registration requests. Questions? Contact Holly Naylor at hnaylor@ncai.org or call 202-466-7767. Interested in volunteering at the conference? Click here to sign up or fill out the form below. For every four hours of volunteer work completed, you'll get four hours of conference attendance totally free!